Rabies is a virus that is a member of the rhabdovirus family. It is an enveloped virus and as such is susceptible to various chemical disinfectants such as Nolvasan®, formalin, Rocal-D®, and ultraviolet light. Rabies virus remains viable in a dead carcass for less than twenty-four hours although it survives much longer (days) in a refrigerated body. Virus detection is not dependent on the virus still being alive, but on the presence of the viral antigens being present. Freezing of the body will destroy these antigens. Therefore, never freeze any specimens suspected of having rabies. All warm bodied animals are susceptible to rabies however the degree of susceptibility varies greatly. Foxes. coyotes, jackals, wolves, and certain rodents are the most susceptible. Skunks, raccoons, bats, rabbits, cattle and some cats are highly susceptible. Moderate susceptibility include dogs, sheep, goats, horses, monkeys. All birds and primitive mammals such as opossums and armadillos have a low susceptibility. Transmission of rabies is almost always due to the bite of an infected animal. Other modes of transmission include bat caves with aerosolization of virus and direct contact of laboratory virus to the eye. Other possible causes are unlikely but it should be remembered that many of the human cases have no known history of exposure to a rabid animal. There are over 27,000 cases of animal rabies reported worldwide yearly, and almost 500 human cases reported world wide. The actual numbers are much higher. Recent reports suggest that in South Asia alone 20,000 humans die from rabies on a yearly basis. Rabies is primarily a disease of wildlife in the Northern parts of the world, whereas in the southern hemisphere the dog is the major species infected. Despite the fact that all warm blooded species are susceptible, rabies virus in a given geographic area usually restricts itself to a single carrier animal. For example wildlife such as skunks, bats, raccoons, and foxes are all reservoirs of infection in different areas of the United States. These wild animals serve as the reservoir which transmits the disease to dogs, cats, horses and cattle that in turn expose people to rabies. Dog and cat rabies tends to increase in areas where the above-described wild animal rabies is present. The Texas border with Mexico is a hot spot at this time, with over 50 cases per Border County being reported per year. Although not yet achieved in these regions, for rabies to be controlled in the dog and cat communities over 70% of them must be vaccinated. Dog rabies overall, is on the decline. Cat rabies is on the increase, and since 1981 cat rabies has exceeded dog rabies. This reflects the low number of cats that are vaccinated for rabies. Cats usually exhibit the dumb form of rabies. The dumb form of rabies in a cat causes it to be reclusive yet the cat may attack humans and other animals when disturbed. Foxes are important in the transmission of rabies as they may have epizootics (epidemics of a disease in a wild population) which are due to periodic overpopulation and stress and increased contact with each other. Foxes do not harbor the virus without showing signs as skunks do. They may have the furious or the dumb form of the disease. Foxes are uncommon sources of human infection. They are more likely to transmit it to a dog or cat. Bats are commonly thought to be a source of rabies to dog, cats and humans. Insectivorous bats do have a high incidence of rabies perhaps from sharing caves during migration with vampire bats of Mexico. 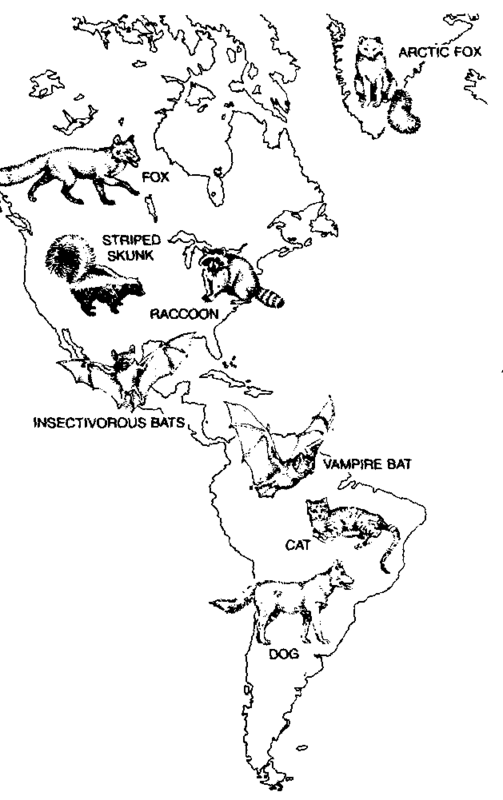 The course of rabies infection in bats is protracted and long. Bats do not serve as latent carriers of the virus. Rabid bats have almost never been reported to attack humans. Humans and animals have been reported to be bitten when handling a fallen bat or one captured in some other fashion. Vampire bats in Mexico, Central America and South America are a major rabies threat to people and animals. Over 500,000 cases of cattle rabies are attributed to vampire bats in Latin America alone each year. Rodents and Rabbits rarely have rabies. The incidence of rabies in squirrels rats, mice, and rabbits are extremely low. Rodents and rabbits account for a high percentage of animal’s bites to humans but there has never been a confirmed case involving transmission of rabies to a human. Rodents are extremely susceptible to rabies under experimental conditions but are rarely determined to be infected naturally. We do not send the head of these animals for analysis of rabies in bite cases. If a client calls and says that a member of the family has been bitten by one of these animals refer them to their human doctor.